Growing industrial market along with increasing inflow of investment in the construction and residential sectors are some of the key factors which are driving the market for self-priming pumps in India. In India self-priming pumps market, the residential application accounted for the highest market revenue share owing to availability of supporting infrastructure and wide installation. In India, the Northern region held the largest India self priming pump market share on the back of increasing infrastructure development activities in the Northern region. The Northern region is expected to lead the India self priming pump market forecast revenues over the coming years. The India self priming pump market report thoroughly covers the market by self-priming pumps types, applications, head range, HP range and regions. 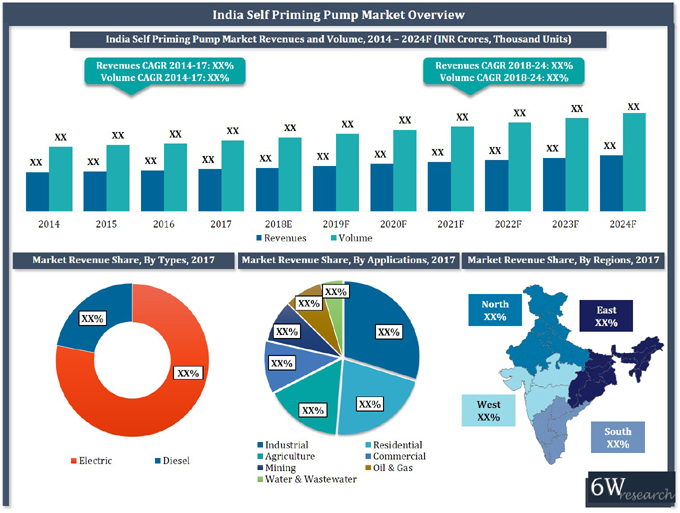 The India self priming pump market outlook report provides an unbiased and detailed analysis of the India self priming pump market trends, opportunities/high growth areas and market drivers which would help the stakeholders to device and align market strategies according to the current and future market dynamics. 13.5 Crompton Greaves Consumer Electricals Ltd.
13.7 Grundfos Pumps India Private Ltd.
13.10 Xylem Water Solutions India Pvt. Ltd.